Pakistanis are a great nation and they love their country, flag, anthem and all other national identities very much. Pakistanis have set various types of world record in past. 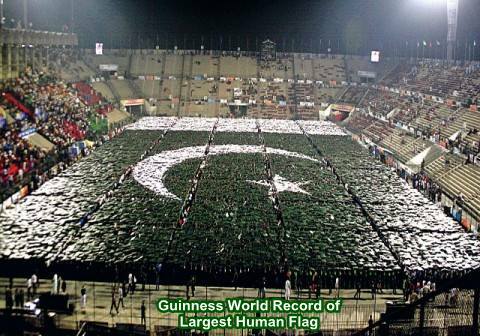 Now they have beaten World Record of Human Flag by making Flag of Pakistan with 24,200 people. This event was organized by Government of Punjab under Punjab Youth Sports Festival on Monday 22 October, 2012 at National Hockey stadium Lahore. 24,200 people made it with green and white sheets. They have broken previous record of biggest human flag by Hong Kong with 21,726 persons. Guinness World Records has officially accepted this record. Gareth Deaves, Guinness World Record Representative along with his team, witnessed this event. Talking to the crowd, Guinness World Records Adjudicator Gareth Deaves said, "it is amazing, amazing display of unity of 24,200 people here in Lahore tonight. Every single one of you hold this record. It was an amazing view and I am surprised to see the unity of Pakistani youth"
Chairman Punjab Sports Board Mian Hamza Shahbaz Sharif was the chief guest of the day. Earlier on Saturday 20 October, 42,813 Pakistanis have also beaten a 5 years old Indian record by singing a National Anthem of Pakistan (Qaumi Tarana) in unison, beating the previous record of 15,243 by India. Chief Minister of Punjab, Mian Shahbaz Sharif was also present there and also sung the national anthem with others. He said that this is not Punjab Festival but Pakistan Festival. This Youth Sports Festival has marked the day as an effort to show the world peaceful and true image of Pakistan.